So states the opening line of The LSD User, the first track off this killer selection of exclusive dubz from Chrome Kids family member Stagga. Indeed this quote sums up the workings of the EP rather well and you don’t need hallucinogenic drugs to appreciate (although it might help). Enter a universe in which the hazy memories from generations of bass and raving culture meet cinematic sci-fi at its glossiest. Where classic Kingston sound clashes have been re-constructed on the Enterprise holodeck so we can bear witness to Duke Reid stepping up into the arena sporting a shiny new pair of phaser guns in his holsters before dropping Rocking Down The House and reducing the opposition to rubble. Where Predator joined forces with King Willy’s Voodoo gang, driving around pumping the creep-stepping Science Of Skank through the tinted windows of his low riding space cruiser. A universe that allows the Cybermen to steal the Tardis and go joyriding back to a 90s rave, but then gets them stuck at the tail end of the timewarp to experience the twisted synths and basslines of Determined Dub. Unutterably strange maybe, but unquestionably good. Stagga’s dubz have been played out by the likes of Mary Anne Hobbs, N Type, Starkey, Raffertie, T Minus, Hatcha, Chef and RSD, and this selection has been hand-picked by us to guarantee that they’ll tear down the dancefloor at any Dubstep jam. If you’re feeling them then don’t forget to check out Stagga’s other releases on Rag & Bone, Rudeez and Robox Neotech. Please notice that this is a limited Fre-release and will only be available for a short period. Contact us at the address to the right for Stagga bookings. 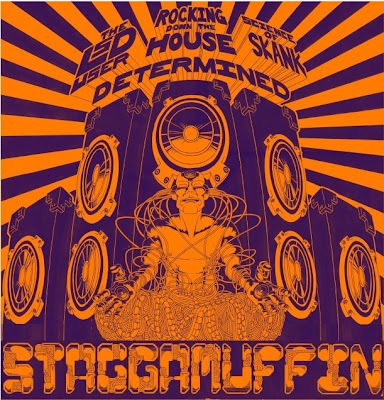 Posted in determined, dub, dubstep, juakali, lsd user, reggae, rocking down the house, science of skank, stagga, terminator . Bookmark the permalink. RSS feed for this post. Stagga is a great dub band!! highly recommendable as introduction to the doubt world!